then cooked in parchment and finished under the broiler. The bold flavors of the stuffing make otherwise mild flavored leeks sing. leeks, raisins, dill, pecans or almonds, cheese, olive oil, salt, pepper, vinegar, anchovies, Worcestershire sauce, and hot sauce. Trim off the dark green end of the leek and finely chop until you have one cup. Starting 1/4-inch from the root end, slice the leek lengthwise being careful not to slice through the bottommost part and rinse under cold running water to wash out any dirt. 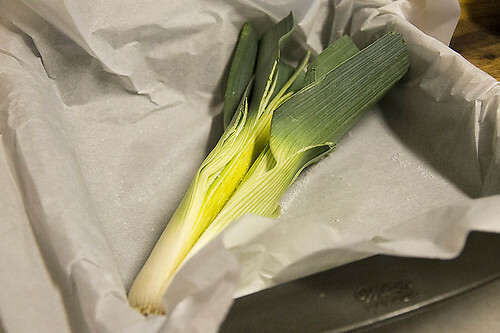 Place the prepared leek in a baking pan lined with parchment paper. 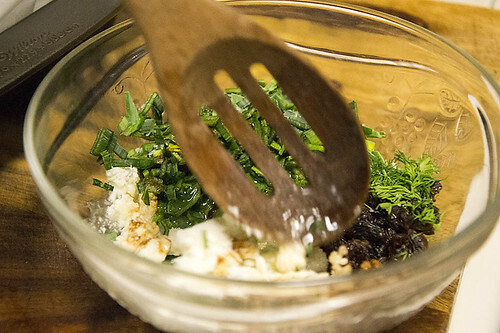 In a medium bowl, mix the raisins, cheese, dill, vinegar, hot sauce Worcestershire sauce, pepper, almonds, anchovies (if using), remaining salt, and reserved chopped leek greens. 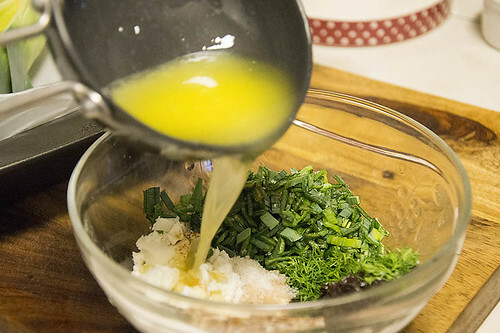 Add the butter and oil to the cheese-raisin herb mixture. Stuff, stuff, stuff, the mixture into the prepared leek. 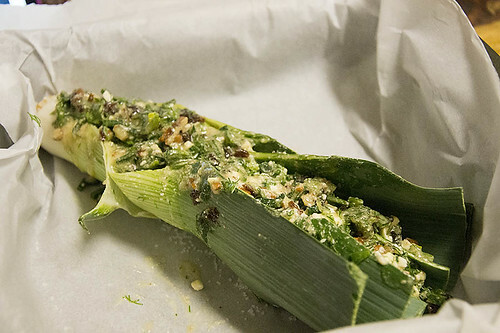 Encase the leek in a parchment paper package. Bake in a 425*F oven for about 30 minutes or until the leeks are soft. 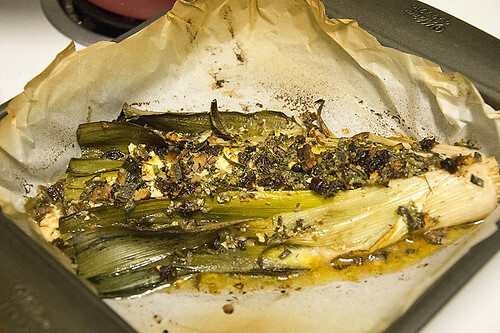 Open the parchment paper package, trim away any excess paper and place leek under the broiler until the leek is charred in a few places, 2-3 minutes. Here's the recipe I used, my changes in parenthesis. Prepare woodburning or indoor oven to 425*F. Line a large rimmed baking sheet or cake pan with a 15X34-inch piece of parchment paper (half the sheet will be hanging off) or use two 13X17-inch pieces. 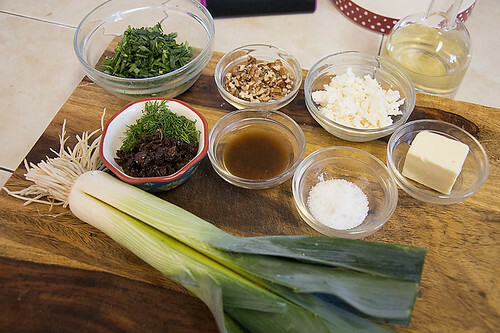 Cut the dark green parts off of the leeks, then finely chop them until you have 1 cup; reserve. Starting 1/4 inch from the roots of the leeks, cut the leeks lengthwise down the center, leaving the bottommost layer intact. Run the leeks under cold running water, gently separating the leaves to release any dirt, then pat dry. Transfer the leeks to the prepared baking sheet. Sprinkle 1/4 tsp salt over each leek. In a medium bowl, mix the oil, butter, raisins, cheese, dill, vinegar, hot sauce Worcestershire sauce, pepper, almonds, anchovies (if using), remaining salt, and reserved chopped leek greens. Spoon scant 1/2 cup of the mixture down the center of each leek. 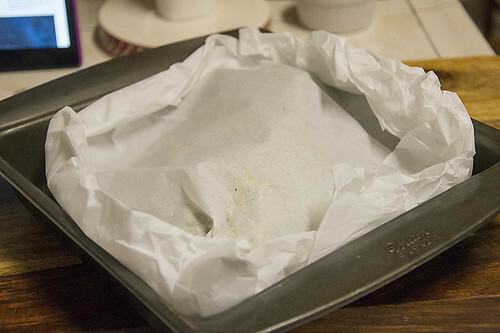 Fold the hanging edge of the parchment paper over the leeks, or place a second piece of parchment on top, to cover. Tuck the edges under and fold, creating a sealed pouch. Roast for 30 minutes. Then remove and discard the top layer of parchment paper. If cooking with wood fire, shift the pan closer to the heat source. For an indoor oven, preheat to broil. Roast or broil the leeks until the leeks are filling slightly charred in places, 2-3 minutes. Carefully cut each in half crosswise using kitchen shears of a sharp knife and serve. Saveur Magazine Jan '17 issue.